As this was our first looooong trip, had to plan in advance for the trip. Also had the list of things to be ready with. 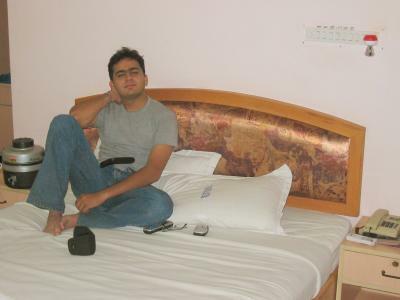 We decided to stay in Bangalore on Oct, 9th, 2005 (Sunday). The return plan was similar to this one. We will leave Bangalore on Monday morning at around 10 so that we can reach Kurnool at around 6:30 with the same breaks we had while going. And again will start Tuesday morning at 6:00am from Kurnool to Hyderabad so that we reach office by 11:30. 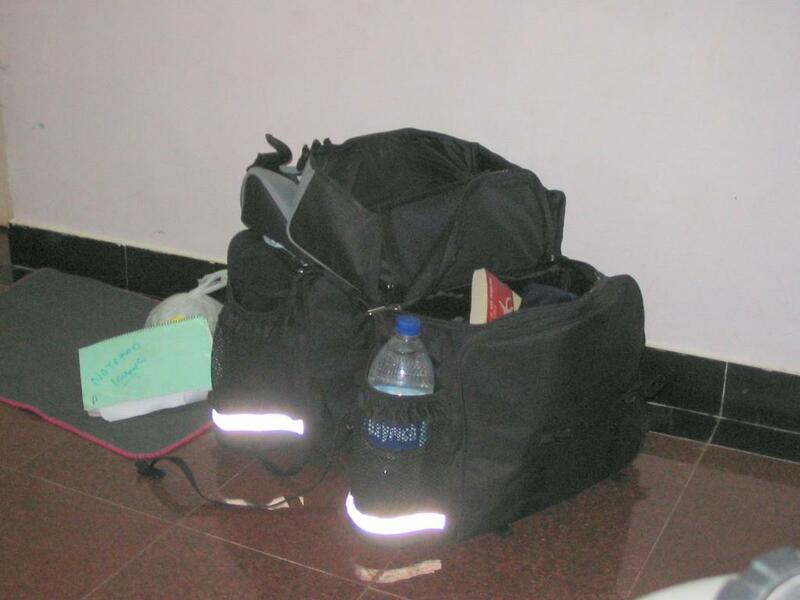 On my earlier trip to Warangal, I had decided/learnt that one cant go on a longer trip if you have to carry the luggage on your back. So saddlebag was necessary. I just bought a Saddlebag. before leaving for the trip from cramster. Day 1 : 7th Oct, 2005. Chapter 1 : Hit the highway soon, maan. I woke up at 7 am (bang on time !!!) and was ready by 7:45. 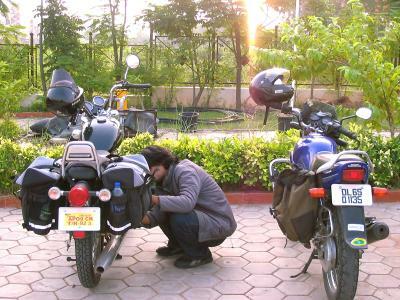 My bike was at the service station so had brought Rahul's bike the day before. After packing and all, started for Rahul's place. Reached there at 8:15 (15 min. late). Took a rickshaw to office and was in office by 9 am. We are working on a tight schedule. Kept working for 3 hours, in between also made calls to the service station. At 12:00 noon, left office. The service station is more than 15 kms from the office. I had to take a rickshaw, which took some 50 min to reach there. It has started getting hot in Hyderabad and is almost like summer. The temperature was high and infact, I was feeling a bit tired cuz I had woken up early and after than I had nothing for breakfast or lunch and had straight away gone to the service station. We were already behind the schedule by some half an hour. I was getting worried cuz we had to touch the highway by 2 pm. None of us wanted to drive at night. Well, what more can you expect, the bike was not ready, many of the mechanics had not turned up the same day I was going for the damn tour. The owner told me that It would take some 20 min to get the bike ready. I told him to forget it and give me the bike. He advised me against it as I was going for some 1400 kms. I had no choice but to agree with him. It took him 40 min. to get the bike ready. I paid him and bought the additional clutch wire, throttle wire, headlamp, chain part and left for Madhapur where Rahul was waiting for me. To our surprise, there is a 6-lane road. The highway looks good. We are driving at 60. Dont want to push the bike for initial 50 odd kms. We pass a couple of villages. We know that we are late by an hour and may have to travel half an hour in the night. Suddenly, out of the blue, it starts raining. 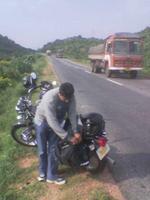 Its not so heavy so we continue to drive slowly at 40 towards kurnool. After 5 min, suddenly there is this storm. It starts raining cats and dogs. Its a storm and havent seen the force at which its raining, often in my life. We were not wet cuz of the rain for the last 10 min cuz both of us had jackets. But the 10 second of storm was enough for both of us to get completely wet. The traffic has come to a complete halt, even the cars are stopping at the road-side dhabas. We take a shelter at a small chay shop. Still some 145 kms are to be covered we have lost some 15 min more. It's around 3:45. For the first time, we really doubt whether we can really go ahead now or shall we postpone the trip. Had it rained half an hour ago. We definitely would have postponed the plans. To our relief, the rains recede and, we start our journey again. It's still drizzling a bit. We are going at the speed of around 50. Adding to our frustration, it again starts pouring... and we are again forced to stop at a Dhaba. The only thing in our mind is that we might have to drive at night. We decide that if at all, it stops raining, we'll drive till 6 and then stop for dinner (remember ??? I have not had my lunch) and then the last 70 kms will have to be driven at night. So we decide that, its better to keep driving after a truck, which is going at the speed not more than 60. One more thing we find discomforting is that after 25 kms, its a 2 lane road. Quite surprising for a national highway, forget about the dividers, It should at least be a 4 lane road. Rahul prays for a completely reverse weather. Of a bright and sunny day. Its already 4:15 so we laugh at the thought/prayer. The intensity of the showers gets less so we start our journey again. 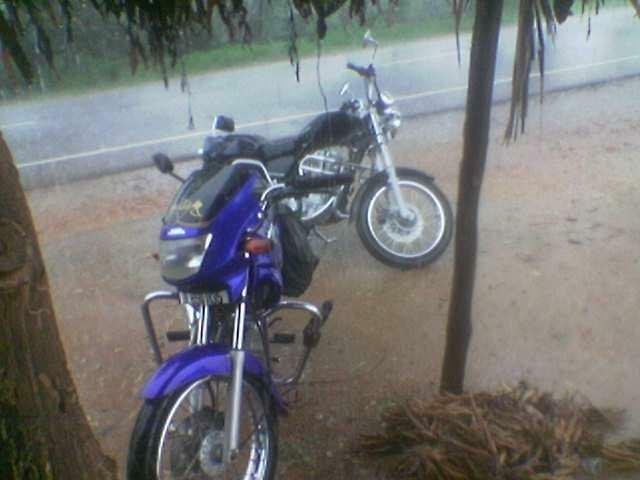 There is a sizeable crowd in the Dhaba due to the rains and I see most of them looking at my bike. They know that we have started for a long ride cuz of the saddlebags laden bike. I feel proud and hope to reach Bangalore. We keep driving at the pace of 60 as its only drizzling by that time. We would only have gone 10 kms far and ... and ... and what do we see ? The skies have opened up and not only that It is bright and sunny. We thank all the gods and step on the accelerator. I am driving at around 80 and Rahul at around 90. The road is empty. We already have lost some 40 min cuz of the rains and have an hour before it starts getting dark. Kurnool is only 125 kms away. 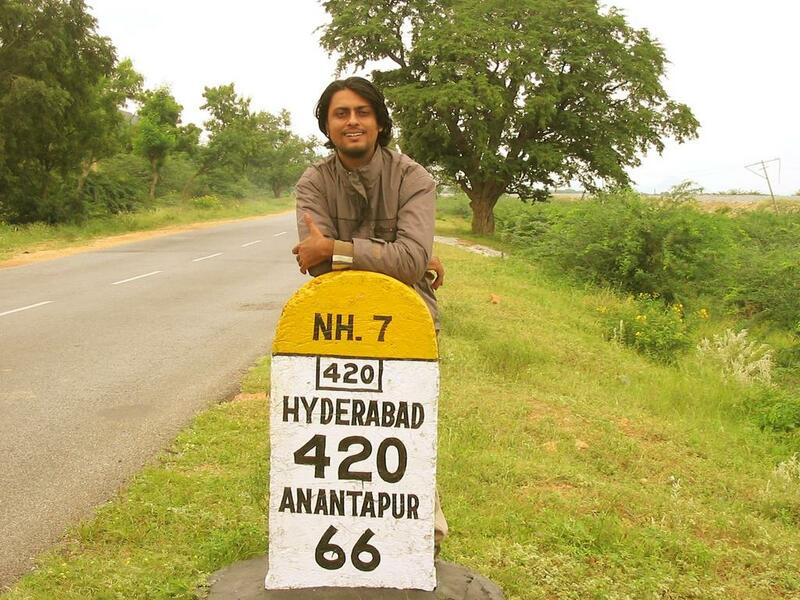 At 6:15, we see the milestone, which shows us that Kurnool is 45 kms away. We have traveled quite a lot and more than that, I am feeling hungry as I only had a couple of biscuits and a dairy milk since y'day night's dinner. We stop by a roadside dhaba and order a Dalfry and Rotis. It has started getting dark. We could have gone some 15 kms ahead before it is night but decide to take rest instead. We face our first challenge of the trip. At 7:00, Its completely dark and we are yet to cover some 45 kms. We are behind a truck. We find that the truck is driving too slowly so we overtake it and find another truck. Which is going even slower. One more overtake and finally we get our "dream truck", which is going at around 55. After 10 min.s the truck driver decides to increase the speed. We follow the same and are heading towards Kurnool at 75. At 8:00 pm we finally reach our first milestone of the trip. Find out the Punnami Resort after the usual inquiries to localites. It has been a long day and both of us are quite tired, and thats when you find a hot shower like heaven. I enjoy being in heaven for 10 mins. The good thing about the government run resorts is that they are quite big with lots of open space. You will definitely find them not as clean as compared to the private-run resorts/hotels but still they are okay. We have our dinner and then head towards our room. Rahul is watching TV and I continue with my book "The Curious Incident of the Dog in the Night-Time". We are tired has hell but having driven for 5 hours, it is difficult to sleep. Especially when you are in a mode of being utmost careful and always have a thought of a truck coming from the opposite side. The alarm is set for 5am the next morning and we are finally able to sleep at 11:30. Day 2 : 8th Oct, 2005. Well, both of us knew that it would not be possible to be ready by 6am. We felt that we hardly slept when the alarm started ringing. One more alarm was put in place for 5:30am. and We really slept for this half an hour. We hit the highway at 7:40 and again are late by 1:30 hours. Bangalore is 370 kms away. If you are going for a long trip on a bike, the best way to cover the distance is to drive for as many hours as possible in the morning. 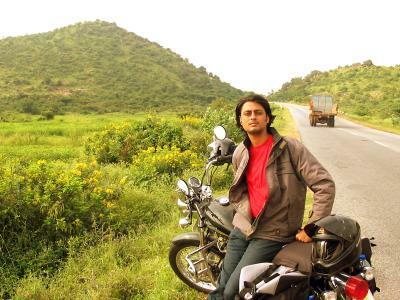 For a single engine bikes like Bullets and CBZs ( I dont think in India, we have many V-twin engine bikes) the distance you should cover at a stretch should be 50 to 150 kms. It is good to stop the bike after 100 odd kms and take a 5 min break. If you go beyond 150 kms, there are chances of breaking down or stretching the engine too much. We decide to take our first break at 150 by which we will need to fuel ourselves as well as the bike. Both the bikes are giving pretty good average of more than 35. The road is again almost empty, only some odd trucks coming and going. We are driving at a healthy speed of 70. At around 10:30 we take our first break after fuelling the bike. There is a good hotel and we have decided to have our lunch early. Instead of a half an hour break, it takes us 1:30 hours as we are the only customers and they are just not ready for us. It takes one hour and ten min.s for the food to get prepared and 20 mins more for us to get it finished. Its still okay as we still have enough time. If everything goes right we may reach Bangalore at 4:30. Two hours late than the scheduled time. 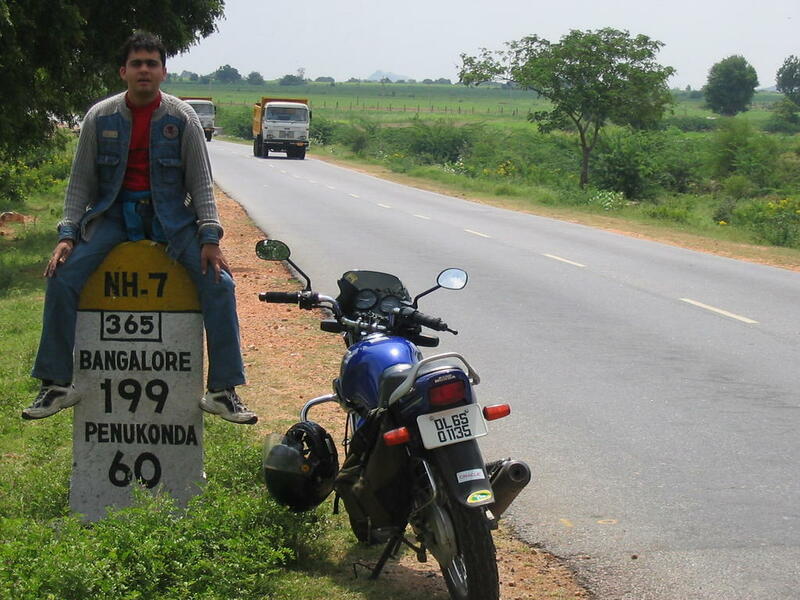 We'll take our next break when Bangalore is 120 kms away. One more thing to take care is that even if you drive at 80, your average speed will only be 50. There are a number of reasons for that. Firstly, its a two-lane road thru out. The road is also one of the busiest unless you travel in the morning. There are a number of villages you will pass by every 30 kms or so. Anyway, we are going at a good speed. and after a couple of hours of driving, Bangalore is 120 kms we decide to take rest at a Dhaba. We reach the Karnataka - AP border point where there are small Tea stalls. Bangalore is only 104 kms and we have driven the last 120 kms in only 110 mins. which has given us a lot to cheer about. Thru out the trip we have decided not take any risks. We seldom drive above 75. After having a cup of tea, we enter Karnataka. Its 2:00pm and we are around 75 kms from Bangalore. I had called nimish that we'll be reaching Bangalore at 4:30. Looks as if we'll reach half an hour early. Nimish lives at Bellari Road, which is nearby the NH07. So we have decided to stay there. 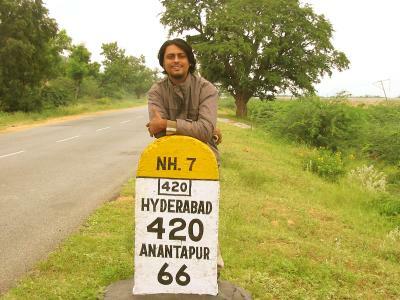 We got surprised by seeing the Nandi Hills board 30 kms before Bangalore. 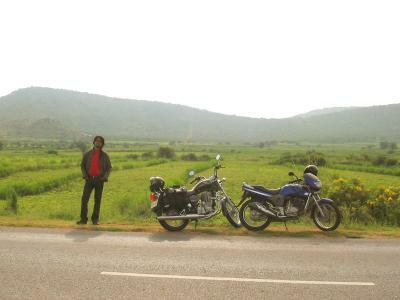 Nandi Hills was my reason to start the trip in the first place. One thought of immediately going to Nandi Hills came to my mind. Which is some 22 kms inside so will just cost me 3 hours today instead of 5 hours tomorrow. But I decide to go with Nimish instead and we keep heading towards Bangalore. At 3:30 we reach at Nimish's place. Only one and a half hours late from the original schedule. Both of us are happy and tired. 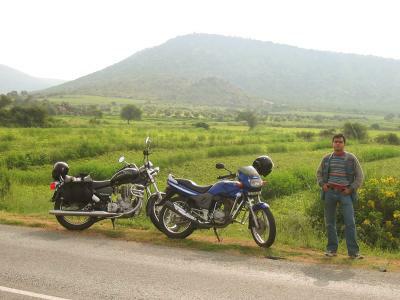 Both of us have lied to our parents and havent told them that we are going to Bangalore by bike. We would probably go back and then tell them the truth. After 12 hours or driving we are in Bangalore. Call up nimish. He immediately picks me up from the CBI circle. Rahul decides to leave immediately for his friend's place. I take a hot shower, have supper at 5:30. I am so tired that I can sleep straight away but as it will affect my schedule tomorrow, we decide to go to MG Road and have a couple of drinks in a pub. After coming back, I go to sleep immediately. 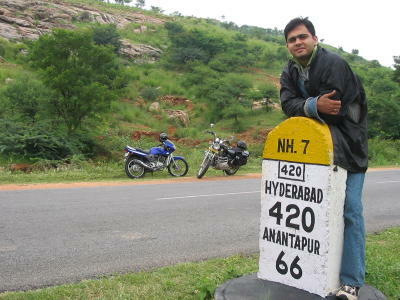 Tomorrow, me and nimish will go to Nandi Hills. Till then, adios. !!! Day 3 : 9th Oct, 2005. 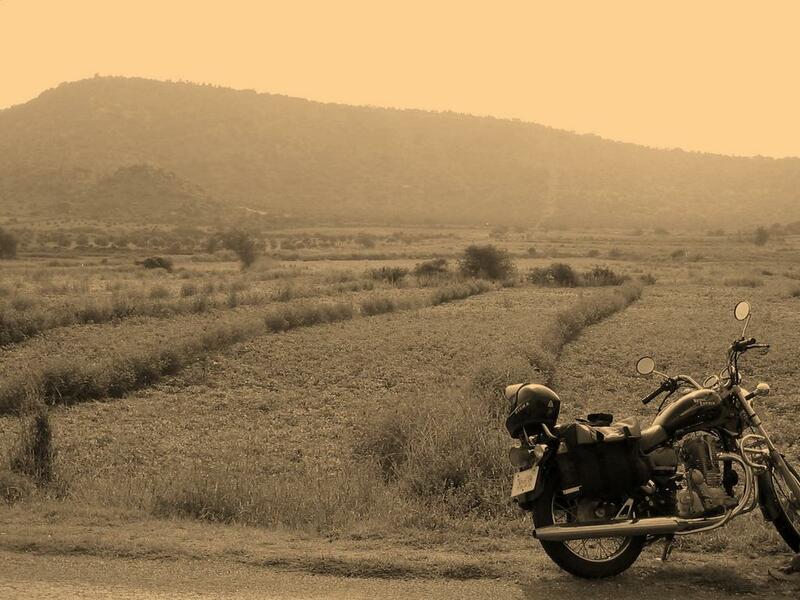 Chapter 4 : The Nandi Hills. Nandi Hills is some 50 kms from Bangalore. 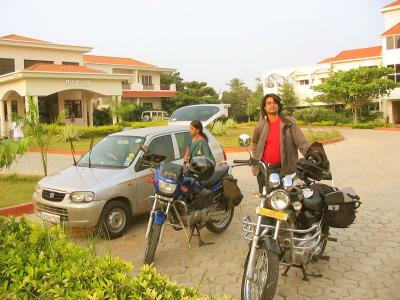 Some 14 months back I had gone there with Jayesh-Purvi, Rankit and Prashant by a car. Its a beautiful place. 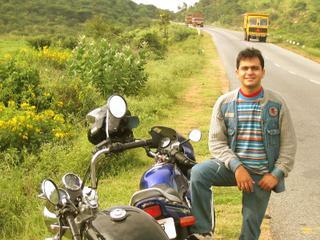 Back then, I had decided to go there again on my bike. and here I am, on my brand new Thunderbird. While coming to Bangalore I had a look at the road so I knew It would take around 5 hours round trip to visit it. Had a peg of brandy y'day night and slept at 1. Woke up at 11 had breakfast and got ready. 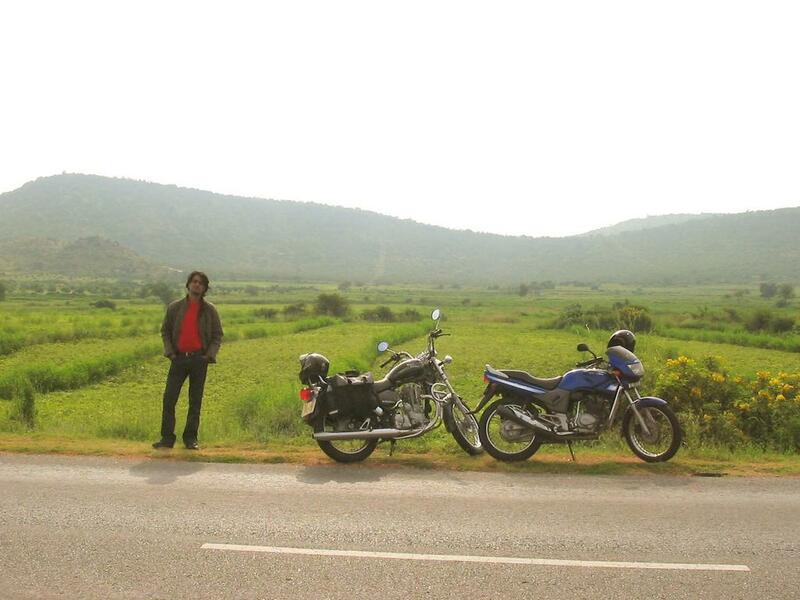 We started at around 1 for Nandi Hills. Bikes condition is still good. Still have a feeling that the clutch wire might break down in the way going back. Nimish asks me to let him drive as I might be feeling tired cuz of 2 days of hard driving. Maan, Can I feel tired ? This is what I have come for... I decide to give him the bike while returning. Reach at around 3 and talk about a lot of things. He has almost settled down and is waiting for the next step of his life. His marriage.... !!! We come back at 6. Rahul was at his friend's place from y'day. We are going to meet him at the Forum mall. He'll be staying with us and then tomorrow we'll start for Hyderabad. The good thing about Nimish's room is that its only 1 km from the national highway which probably will save us an hour or so. Day 4 : 10th Oct, 2005. Chapter 5 : The dream ends... Back to the real world. Dont know how can one get up so early when he is traveling. Rahul and me are ready by 7:30 and leave Bangalore. Rahul is fasting today as its Monday. We buy a couple of mineral water bottles, fruits for Rahul, a couple of canned juices and biscuits. After fuelling Rahul's bike we start for the final and the longest stretch of our journey. We are going to ride for 590 kms (12 hours) today. Have been lying to my dad about the trip. I hope we reach there safely so that can call him up and tell the truth. 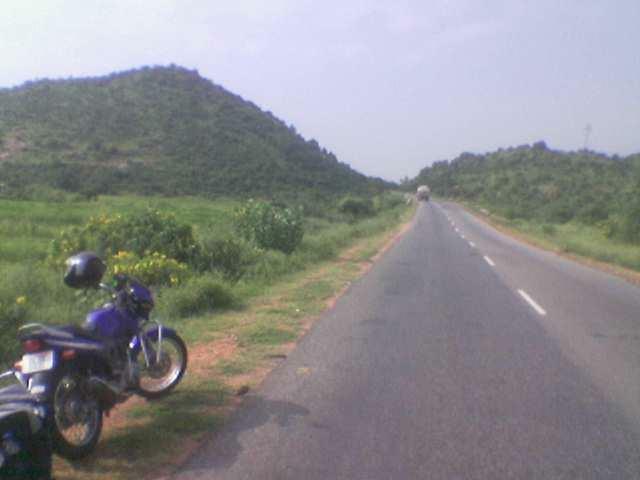 The NH07 starting from Bangalore is a very boring road. It's a 6 lane road for the first 25 kms or so. But still is in the phase of being built. You have to keep on changing the lane and drive in only one of the 3 lanes. So effectively, you have to face the vehicles coming from the opposite direction. There are at least 5 railway lines crossing the road where bridges are being built. The first village is Devanhalli. After which again the same story of a 2 lane national highway. It takes around 75 mins to drive the first 50 kms after then the road is fairly okay with less traffic. I accelerate the bike this time. Cross the 90 kmph barrier for the first time. There are many scenic places along with the road. We have decided to stop at the same places we stopped when he came here. The first being the AP-Karnataka border which is 120 kms. At around 9:45 we are at the border. Have a cup of tea. Both the bikes are in a fairly good condition. We start again after a 15 min break. The next stop is the A1 Plaza hotel, which is 10 kms after Anantapur. This stretch will be of around 130 kms. 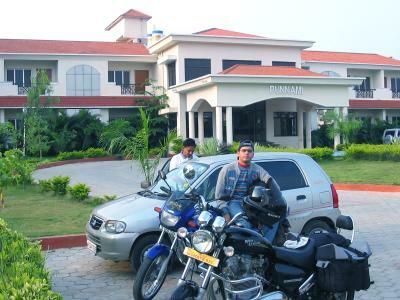 A1 Plaza is a chain of highway motels run by Reliance Petrolium on NH07. You wont find the other hotels as clean as these ones. and this is what I find a bit strange about Andhra Pradesh. If you are traveling in Gujarat you will find good hotels and Dhabas every 10 kms. Here you may have to travel 100kms sometimes and still there are chances that you end up having food at a mediocre place. We are driving at a good speed and it looks as if we would be able to reach Hyderabad by 7:30 which will make us drive at night only for an hour out of which you can discard 25 kms of city driving and 25 kms of the 6-lane driving which means roughly a 20 kms drive at night. Sounds okay !!! We reach A1 plaza at 1:15 and order lunch for me. It starts raining. We are not worrying as we already have a contingency plan. If at all we lose a couple of hours, we can stay at the APTDC Punnami Resort at Kurnool. We fuel the bikes and start off... Its raining but not heavily. We slow down a bit and are driving at 50. Well, this was the last pair of jeans I had. I am completely wet. My bum has started paining cuz of the 300 kms drive. We are still to drive for another 5 hours. 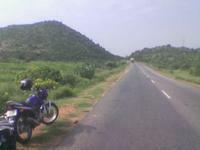 We will stop at Kurnool and then decide whether to go ahead or to stay there. at 8:00 we enter Hyderabad. Finally the dream is over.... I just cant feel any part of my body. Am completely tired. Reach home at 8:20. Call dad immediately and tell him about my lie. He doesnt sound too happy but always knew that I would go. I tell him that I will not take any risks from now onwards. Well, will I ? Both the bikes are okay. My bike needs servicing. Nothing has gone wrong. Apart from the last 75 kms or so the journey was just fabulous. I hope I can travel more... I have read somewhere that people who go on long rides are usually escapists. Be it that way, I want to get tired, and I want to run away as long as the princess allows me... !!! Long live bulleteers !!! Long live princess !!! 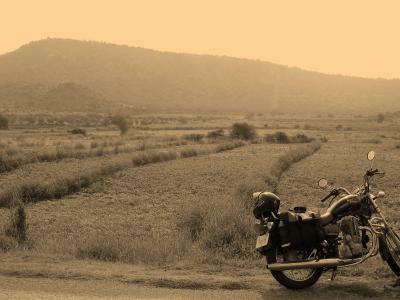 It all started with my dream... My dream of owning a bullet.. having someone with me... and going to Nandi Hills. So what if only half of it came true. So what if it took more than a year to come true. A dream is a dream. This was the first trip and will always remain a memorable one. It took me 1357 kms and 28 hours of driving to live my dream. Our planning was really good. We had a very comprehensive list with us. I wish I had a pair of biking gloves. Which I probably will have in the next trip, if at all I am allowed to go. It was really fun to go there with Rahul. We complemented each other very well in driving. It might not sound very important but believe me, it really is. When you are driving on the national highway, you have to be utmost alert. Cuz the vehicles are driving on the same road from both the directions. We kept on driving at a distance of 500 meters to 1 km. and alternatively one of us was ahead. And at all the times we kept on signaling each other of the coming vehicles from the opposite direction. There were some friends who knew about the trip. I had kept on calling Alka and Soumya every couple of hours. 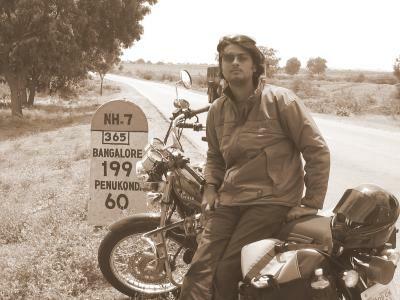 These bike-trips are the other things they are against apart from my growing long hair. Called Jayesh-Purvi, Ketan-Priti, Nikhil-Vishruti who all were worried about me and Rahul. We are back here... and busy with the office work. Planning for our next trip. Which can not happen before December. Till then.... happy riding !!!! Got a feeling that it was a nice trip. Though I still dont approve of long bike rides in Indian Conditions.....but it made an interesting reading! Keep posting your experiences....! I am sure you will have some more of these adventures till you step out of these carefree days of bachelorhood ! Nice and informative blog. 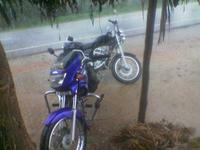 Me and my sister are planning to visit Nandi Hills on our kinetic. I was wondering if the hill roads were safe to ride as I will be riding in parts. Did you guys switch off the engine downhill? Need some tips.